Six years ago this month, the author, editor and publisher of the now iconic Downfall – How Rangers FC Self-Destructed, were putting together the finishing touches for the book before it went to print. Downfall – How Rangers FC Self-Destructed, is once again being reprinted this month. As with The Squad, Phil’s recent novel, we will be offering signed copies exclusively from our Frontline Noir Online Store . Downfall is timeless in that while it describes the lead up to an event of 6 years ago, the liquidation of Rangers FC, it also describes the collusion between media and subject to deny facts, spin untruths, and generally breath life into the sense of entitlement that the Establishment Club had into its successor, the new Rangers. Once again the bulk of Scottish Sports media is missing in action, just as they were in years leading up to 2012. I’d contacted Phil in June 2012 for the first time to discuss a different project entirely. I’d been put in touch by a News International employee who’d recommended Phil. Ironically, the same organisation would deny knowing much about Phil as they threw him under a bus when they cancelled the serialisation of Downfall, a serialisation that News International had specifically requested. I had, in fact, approached them to serialise a different book. It was then that News International suggested, off their own bat, that they serialise Downfall. We agreed, none of us anticipating the hysterical reaction ahead which would result in News International cancelling the second instalment of the Downfall serialisation. 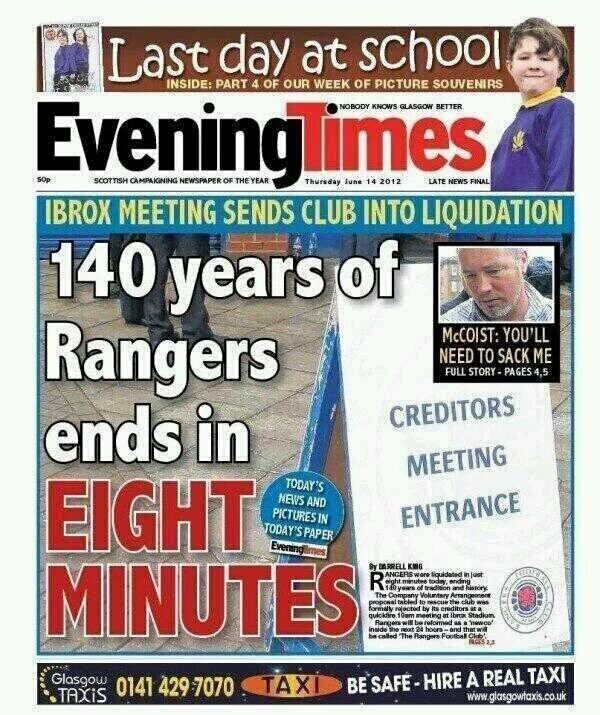 At that time, very few people, whether journalists or punters, were denying the fact that Rangers FC had been liquidated. In fact, the front pages of the most widely-read newspapers had banner headlines to that effect. This was an outbreak of accurate reporting, which was soon contained though, due to the inability of many to accept the truth. 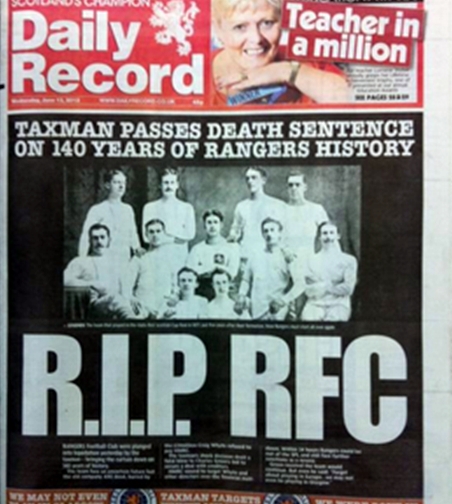 Such was the forceful reaction of an extreme element within the Rangers support, often referred to by detractors as ‘The Klan’, that none of the newspapers above would ever dream of printing these front pages today. 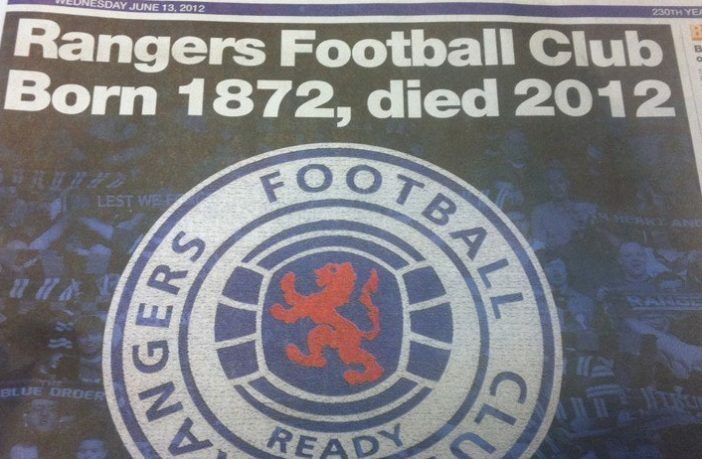 Not only would they never print them again, but they’d never refer to these pages, not even in the context of saying, “Look, we were wrong, Rangers didn’t die. They are still alive. These front pages should never have been printed as they were inaccurate.” The term Social Amnesia can be used to describe a repression of memory by a group of people. This accurately describes the current repression of The Four Headlines of the Apocalypse. Downfall, then, can not only apply to the downfall of Rangers FC, but also to the downfall of Scottish Sports Media as an independent, objective, fearless collective. As an entity, Scottish Sports Journalism became a circus, reducing itself to performing gravity-defying acts of intellectual contortion as it simply sought to transcribe the New Story without ever calling it the New Story as that would necessitate reference to the Old Story, which in turn would undermine the New Story. The theory, of course, was that if the New Story was repeated again and again then the punters would forget the Old Story, the one on the front pages above. Even on sports radio shows in Scotland, no one, not the journalists or the phone-in callers, are allowed to mention Newco, Sevco, The New Rangers, The Old Rangers. The few who have done so have been pilloried and, in the main, undefended publicly by their peers. When The Mob, or The Klan (call that unscrupulous element of the Rangers support what you will), get their metaphorical boots into “errant” journalists who committed the transgression, deliberately or inadvertently, of referencing the facts that dare not speak their name, look how few of their fellows, their comrades, came out fighting and publicly challenged the lynchers. How many said #WeAreAllAngelaHaggerty, #WeAreAllJimSpence #WeAreAllGrahamSpiers and others? They were few and far between. Perhaps they were outraged privately and got their tuppence worth in behind closed doors. Fair enough. But that’s hardly confronting a mob to the point it is called out and embarrassed, is it? Of course, suggesting every Scottish sports journalist failed in his/her duty to report the truth would be an error. Of course, there were several journalists who came out this whole Orwellian period with their integrity intact, their courage all the more demanding of respect because they were the exceptions. 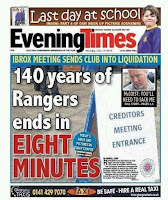 But the vacuum left by the absence of real journalism in the wake (in every sense) of The Rangers Story played a big part in propelling Social Media and while some in corporate media look down their noses at “citizen journalism”, often citing “grammar and spelling”, they would do well to remember, had it not been for journalism failing at a critical juncture in Scottish sporting and social history, then punters like me would have been happy to remain “mere consumers of news”. But, when you smell a rat and see that the rat-catcher is fast asleep in a succulent lamb-induced food coma - or at least pretending to be - it’s natural to stop consuming and try to find out independently what is going on. You don’t need to be a vegetarian like me to not like this brand of lamb. You just need taste. With notable exceptions, Downfall was not reviewed in the corporate media. One journalist I spoke to, and who I knew to be a decent, sane guy, said, “Why invite a barrage of vile abuse, and get stalked by mental cases.” Several journalists refused to even read it while at the same time criticising it, another unseemly intellectual contortion, rendering their views on the book about as pertinent as the those of the Psychic Reviewers, Klanites who’d reviewed the book maliciously on Amazon before the book was even finished, never mind released. Noo, that was clever. We shouldn’t complain. All this furore helped make Downfall a bestseller in Scotland. Book stores sold it very well despite some having to sell it under the counter due to fear of staff being harassed by less than well-wishers who’d intermittently berate staff for stocking the book. Both of these facts became added to the list of Facts Which Dare Not Speak Their Name. 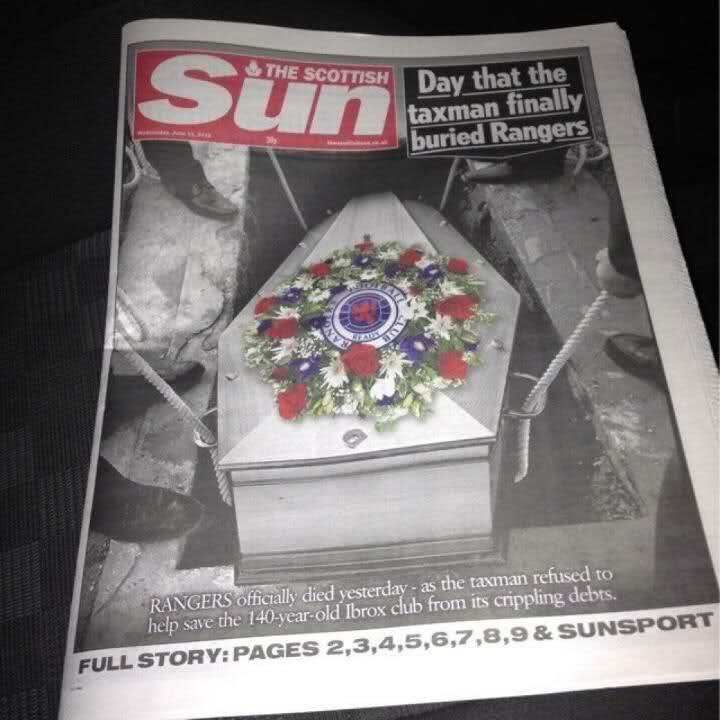 The bottom line is that you have to ask why Downfall is still the only book on the demise of Old Rangers. It was one of the biggest sporting stories in Scotland’s history. And yet the silence on the event is deafening, even in 2018. We will continue to reprint Downfall, if only to enable the echo of history to break through that wilful silence. The Squad by Phil eBook now on Kindle. 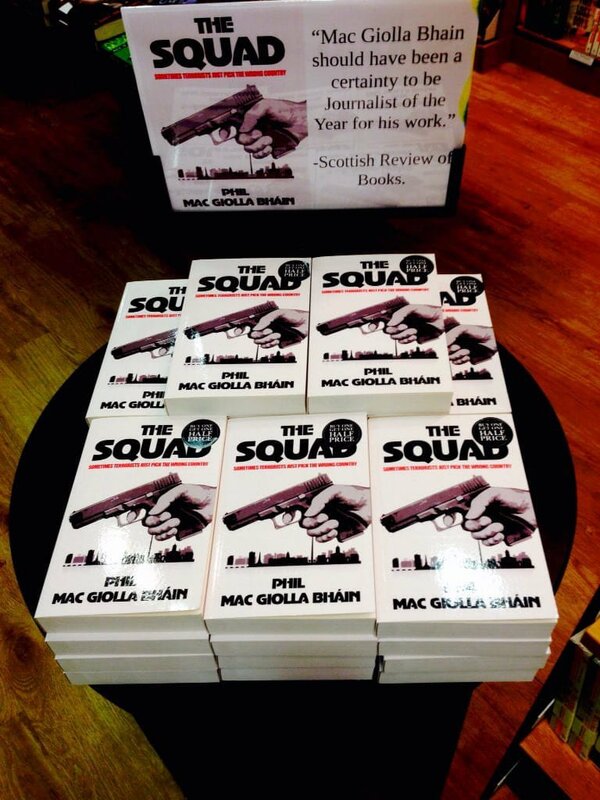 We’re delighted to announce that The Squad by @Pmacgiollabhain is now available on Kindle for the first time. We were blown away by demand for the paperback edition of this title, which was printed in June and sold out within 4 weeks. We still have signed copies though in our website store. As always with Phil’s books, publication of The Squad was immediately accompanied by comments from The Psychic Reviewers. Trouble was of course they were more careless than before in that the first of their malicious reviews appeared the day the books were posted out, meaning that unless their posties could time travel, they could not have possibly read the book. They even got the amount of pages in the book wrong, something someone with an actual copy couldn’t have done. Very amusing. 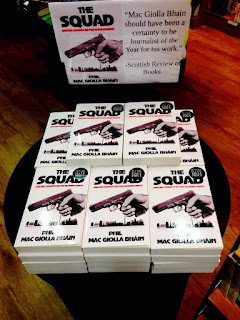 Pleased that both Waterstones and WHS (Book of the Month) have supported and done well with the paperback edition of The Squad, as you can see from their photos. I hope you enjoy the Kindle edition of this title which can be bought here, as can Downfall eBook on kindle too. Perhaps Trump telling the NATO countries to ‘stump up’ is him paying back some donors and also making a pitch for Clinton/Bush donors and their bought politicians in Congress. Even psychopaths like Trump can be pragmatic and he’s learned the internal power dynamics of Congress and the lobbies. ‘Operation Stump Up’ is about transferring hard-earned European tax Euros and pounds into the dollar accounts of arms companies and their shareholders and their political protectors. It’s ‘protection’ money in many senses. This is gangsterism. But, Trump didn’t invent this. He’s just the messenger here. The US, like all empires, has evolved into a Vampire State, run by corporate vampires for corporate vampires. Unable to sustain itself with its own resources it is ever more ‘taxing’ its vassal states. The US didn’t invent this. History shows this is what empires do, especially when coming to the end of their lives. Anyone with experience in management knows that the more control you have, the less control you need to exercise. The naked use of power is the last resort of decaying Power. The phenomenon of Psychic Reviewers appears again on Amazon. These guys are clever. So clever that they have the ability to review a book that, not only have they not read, but hadn’t even been released to the public. We started posting books out on the 21st June. It’s only in the coming week that the book will be available from Amazon, Waterstones, WHS etc, , or indeed anywhere else apart from our web site, where was exclusively available until week commencing 25th June. So, reviews dated 22nd, positive or negative, cannot be based on a solid reading of the book. Reviews dated 23rd, must include speed readers. However, based on the hysterical (in every sense), malicious reviews placed that day one doubts that basic reading, far less speed reading, was within the grasp of those posting rather silly comments. Some, sadly, see the Amazon review facility as an opportunity to promote petty personal vendettas rather than to actually read the book. Reviews, good or bad, are facts of life. No one should publish if they can’t handle reviews. But you have to wonder at the motivations of those who feverishly post a review on a book that they clearly have not read. Fortunately, all the Psychic Reviewers achieve is to help folk who already hate an author hate him/her a bit more, and those who love an author love him/her a little more. As with Phil’s Downfall book, these chaps actually help sales. They’re a marketing man’s dream. There is just now a very worrying McCarthyesque campaign to discredit democratic dissent in the UK. In a democracy people should appreciate the value of democratic debate at times of crisis as a means of determining the correct course of action after taking all points of view on board. Establishing the truth in conflict situations is extremely difficult. Hence, the value of thoroughly investigating an alleged war crime to (a) confirm it has taken place and (b) establish who committed it. It is one thing to defend Assad but, it is quite another to request that, before we bomb Syria, we ask questions that anyone who wants to find out what happened in Douma would ask. So, the branding people who ask such questions an “Assad apologist” raises its own questions. What would those who wanted to bomb Syria have lost had they allowed an investigation - which was due to start on Saturday, the day after the bombs fell – to take place? The element of surprise? Bearing in mind Trump had tweeted the world that missiles were acomin’ that’s not credible. Fear of another imminent CW attack? With the rest of the world’s eyes on Douma and the actions of Assad’s army that isn’t credible either. So why the rush? A cynic might suggest that US/UK feared any investigation might show there was either no CW attack or that Assad was not responsible for any CW attack, thus invalidating the ‘humanitarian intervention’ legal defence that US/UK intended to employ in their self-appointed role of World Policeman. Either way, perhaps the last thing the world needs is trigger happy sheriff. Hence the need for the rule of law to be respected. And if the sheriff’s suspect is convicted then punishment can be meted out. But surely not before an investigation, never mind before a trial. So, anyone with respect for the rule of law, for justice and a determination to uncover the truth would welcome challenging questions, wouldn’t they? Apparently not. Not only is there a near-uniform across the media retort of “Assad apologist” directed to anyone asking these questions, there is now a determination among some that such questions should not be asked at all. Take this example from Sky News yesterday involving The Henry Jackson Society’s Dr Alan Mendoza on the pro-bombing before investigation side and Prof Piers Robinson on the pro-investigation first side. Mendoza started by reiterating the pro-bombing before investigation side’s mantra of “Assad has form” argument. Robinson countered by saying some sources (such as the Red Cross) stated there was no proof on the ground in this instance and followed up, logically, that a “proper investigation” should take place to avoid repeating “past mistakes”. Mendoza replied that three countries (US/UK/France) have evidence, a contention he tries to back up with such expressions as these countries “clearly believe” and “It appears they have evidence”, rather than “have demonstrably proven” or “definitely have proof”. Obviously, such notions are not reasonable to some in The Henry Jackson Society, seeing them as obstacles to the march of their special brand of imperialism. Opponents are not there to be argued with. They are there to be crushed. Mendoza finally – and memorably – runs out of patience, ranting that its “absolutely appalling” that “national television” allowed someone with Robinson’s views to “defend a dictator”. Of course, run through the tape and you’ll find not even a slight defence of Assad. Mendoza either misunderstood the conversation or made that up. It was a crude attempt to delegitimise “reason, “thought”, “investigation”, “objectivity”. The Sky anchor then reasonably suggests – more to defend Sky than Robinson, but commendably nonetheless - that it’s fair to ask questions like, “what might happen after Assad” without being called “an apologist for Assad”. But Mendoza is having none of that. His mission appears to have been to appear on our screens solely to spread this smear as far and as wide as he can in the time allowed. “No, I think you are very much being an apologist for what Assad has done”. Exchanges like this tell us that legitimate dissent and argument is under attack. Mendoza’s momentary lapse of reason illustrated the desire among his ilk to intimidate the likes of Sky News out of (a) ever inviting dissenting voices into our screens and (b) ever daring to ask challenging questions themselves. This isn’t idle conjecture. The organisation he is a member of, the super-connected Henry Jackson Society, is a Neocon outfit who see it as their mission to influence discourse and therefore opinion and indeed task some members with campaigning against dissenters from the Neocon narrative, such as Chomsky and others. See here this copy of the minutes of its Post London Launch Meeting, attended by, among others, one Dr Alan Mendoza, cited therein as its Executive Director. Dr Mendoza and his sort are perfectly entitled to campaign for their views. But I’m not sure they believe we all are. Ministers on the national security council were told that the chemical agent used was from a family of substances known as “Snow”. “Based on the positive identification of this chemical agent by world-leading experts at Porton Down, we surmise that Russia has previously produced this agent and would still be capable of doing so". Opposition leader, the traitor Jeremy Corbyn, was sentenced to death by many in his own party when he claimed that Snow may not be manufactured exclusively in Russia. I strongly support a ceasefire in Ghouta. But then, people like me strongly support ceasefires unconditionally anywhere, in all circumstances. Sadly, that’s where we differ from many Western leaders and media, with admirable exceptions. Calls for ceasefires from Lebanon 2006 to Gaza 2014 and from Yemen to Raqqa and Mosul, have fallen on deaf Western ears, regardless of the human suffering. In fact, in Raqqa, the US went as far as to reject such calls as it would “give ISIS time to regroup”, the slaughter of women and children evidently “being a price worth paying”. Ironically, civilians are always in the frontline of wars “for civilisation”. Bombing them anywhere is criminal according to international law. But, no matter how the lofty intent, war always, always, comes down to obliterating families in their homes, killing their children, and then either “regretting” it happened, or claiming to have done everything possible to avoid it, or ignoring it altogether. The evidence clearly demonstrates that Western leaders and, for the most part, Western media, consider civilians – men, women and children - just as expendable in pursuit of war aims as the supposedly more brutal Russians and Syrians. When analysed objectively, there is not the slightest difference in modus operandi. No official or journalistic sophistry can disguise that. It’s appalling that us news consumers who depend on journalistic objectivity for truth are subjected to reporting and analysis unable - or unwilling - to disentangle itself from its national perspective. Everything that is happening in Ghouta already happened in Raqqa when the US and allies bombed the hell out of it. The same in Mosul. While Western media reported this, it generally did so with comparative coldness, suggesting civilian casualties were a sad inevitability in the war against ISIS. We did not get a bomb by bomb account of civilian causalities like we did in Aleppo and do in Ghouta. No “last doctors in town”, no Banas. So, it is reasonable to ask are The West’s calls for a ceasefire in Ghouta genuinely humanitarian or are they merely to hold up the Syrian Arab Army’s mopping up of rebel areas? The West has shown beyond doubt that it wants to fight ISIS everywhere - except where ISIS is fighting the Syrian Army. In fact, Western intelligence and its allies have provided ISIS with weapons, finance, medical treatment, refuge. Everything in fact ISIS needed to fight the Syrian Army. People calling for ceasefires here but not ceasefires there don’t have cessations as their primary purpose. A child’s life in Gaza, Lebanon or Yemen should be just as important as a child’s life Raqqa, Mosul, Ghouta, Aleppo. Why then such selective humanitarian concern? Why, to its disgrace, did the West reject demands for ceasefire in Mosul or Raqqa when the civilian population was being bombed, often with white phosphorus. Why are some children expendable and others sacred? Why are some bombings good, and some bad? Why are some weapons (such as cancer-causing White Phosphorous) used without much judgement from the ‘moral’ Western media and others (barrel bombs) cried out to be the embodiment of evil? Is White Phosphorous really any more discriminating than Barrel Bombs? Any more child-friendly? A civilian family having White Phosphorous dropped on it is no more likely to survive than one with barrel bombs falling on it. Yet, Western media seems to love the soundbite quality of “barrel bombs”, a phrase spat out by “moralistic” media types, as opposed to even mentioning White Phosphorous. Go on. Do a count in major Western articles on the words “Barrel Bombs” and then on “White Phosphorous”. While you’re at it, count how many times Western media and officials called for a ceasefire in Raqqa and Mosul and then compare it to the amount of times they called for ceasefires in Aleppo and Ghouta. The explanation for the disparity you will find of course is Geopolitics. See, if civilians, women and children, thousands of little Banas, are dying in the pursuit of strategic aims desirable to the West, then they are done for, abandoned to their fate, a fate barely reported. Whereas if civilians are dying while states resist Western Geopolitical aims, then these are sainted, sacred beings, whose every second of suffering is unbearable to our leaders and their broadly supportive media. Sadly for Syrians, the frontline of Geopolitical struggle, the battle for access to essential resources necessary to project power between the two strongest powers in the world, Russian and The US, currently cuts through their neighbourhoods. You’ll not find much reference to “Geopolitics” in Western media reporting of Syria. You see, Geopolitics can explain a lot. And truthful explanation is not in the interests of the powerful nations of the world. Geopolitics provides a colder, more rational objective analysis of events in context of how states throughout history have behaved and why and, therefore, are likely still to do so. Usually they are vying for position, seeking advantageous access to resources. I have no time for the way the Syrians and Russians are so cheaply discarding human life in Ghouta. But any notion that we in the West are any different is naivety beyond reason. We kill just like they kill. If you are genuinely humanitarian then you'll have no problem condemning Western or Russian bombing of civilians. If you chose to condemn one side's bombing while excusing the other's bombing, then you are not a humanitarian objector. You are a participant.